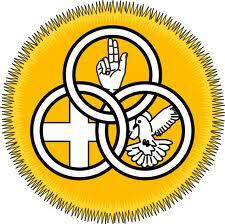 Soul Food for Hungry Adult Communities: Trinity Sunday, May 26, 2013. Soul Food for Hungry Adult Communities:Feast of the Most Holy Trinity, May 26, 2013.
with your heart, you whole being’: Adam ‘knew’ his wife Eve, and they had children. ) Do you know your heavenly Father who ‘knows the number of hairs on your head’? (Matthew 10). Do you know the Father of the prodigal son, who, when he saw his far-away son, ran to him, kissed him, and threw his arms around him (Luke 15)? Do you know the One who gave his name to Moses as ‘I AM’? The one who leads us ‘with leading-strings of love’, as Hosea says? The One who said ‘I have loved you with an everlasting love! I am constant in my affection for you!’ (Jeremiah 31). If you do, then you’re on the way to ‘knowing’ the Holy Trinity better! Do you know Jesus,- ‘know’ him intimately, as friend? Know the one who grew up in Nazareth and lived there until he was 30 years old? The one who gathered disciples around him. The one who to whom sinners and outcasts flocked, to listen to him? The one who was nailed to a cross for you, and for us all? If you ‘know’ Jesus, the Christ, then you’re on the way to ‘knowing’ the Holy Trinity better. Do you know the Holy Spirit who was poured into your heart at Baptism and at Confirmation? The Spirit who is our constant companion, a ‘Comforter’, one who stands by our side always, who is a fire in our hearts when we open the Scriptures? If you ‘know’ the Holy Spirit of God who flows in your veins, then you’re on the way to ‘knowing’ the Holy Trinity better! So, on this Feast, it is a feast, a banquet, a celebration when we make a song and dance together about our heavenly Father, about Jesus his Son, about the Holy Spirit, – three persons in one God. 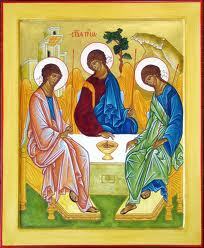 Maybe the word ‘Trinity’ now means a bit more,- a Trinity of Persons in One God, a ‘Most Holy Trinity’ that is our life. Live it! Love it! Celebrate it! Make a song and dance this weekend about who we are and where we are! Find a poem called ‘In Dwelling’, a reflection on the Trinity (‘sometimes it’s ecstasy, sometimes porridge’) written a few years ago. Click here, or go to www.emptifulvessels.com, a selection of reflections by Seamus Devitt C.Ss.R. ← SOUL FOOD for Hungry Adult Communities: Pentecost 2013.